Mentor coaching is offered to coach training students committed to the development of their coaching skills and further advancement in the path toward ICF certification. This is a custom designed package which includes three group coaching sessions and four individual coaching sessions. 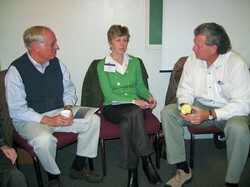 Each participant must be coaching at least 2 clients through the duration of the mentor coaching. These ten hours of mentor coaching fulfill the necessary requirements for the ACC credential through the ICF. This mentoring takes place over a four month period. You will be coached on your coaching of clients while working toward the necessary 100 hours of client coaching required by the ICF. The mentor coach will work with you to strengthen areas of coaching to make you a more effective coach. You will be coached on your proficiency in using the core competencies expected of an ICF certified coach and will receive two written sessions of verbal feedback on your coaching of clients. We will explore strategies and options for deepening your pool of potential clients within and outside of your current ministry context. 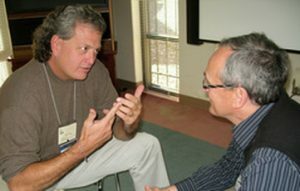 The Holmes Coaching Group brings together highly experienced coaching at the point of greatest need for vitality in congregations, districts, and conferences to bring about the results of transformation. Group Coaching Packages can be custom built to meet the need of the specific organization, and Group Coaching is available through the pre-designed Shift Happens Leadership Institute utilizing monthly teaching videos and peer group learning. Click below if you would like to schedule a time to discuss a group coaching arrangement that will meet your organization’s need.